..."In his new book, A Call to Action: Women, Religion, Violence, and Power, former President Jimmy Carter explores the religious and cultural structures that have led discrimination, war, poverty and disease to fall disproportionately on women. He writes: "The most serious and unaddressed worldwide challenge is the deprivation and abuse of women and girls, largely caused by a false interpretation of carefully selected religious texts and a growing tolerance of violence and warfare. "The statistics about the disproportionate suffering endured by women globally are grim." "Women, who form half of the world's population, work three-fourths of the world's working hours; receive one-tenth of the world's salary; own one percent of the world's land; form two-thirds of illiterate adults; and together with their dependent children form three-fourths of the world's starving people. To point this out is not to make women into a class of victims but to underscore statistics that make clear the struggles women face in society because of their gender. In no country on earth are women and men yet treated in an equal manner befitting their human dignity." ..."The struggle over women's ordination isn't a culture war issue. It is a movement that shines light on the truth that the Roman Catholic church's denial of the full equality of women has global consequences. It seeks to dismantle the poverty, abuse and violence that are intricately tied to the systematic belief that women and men are not equal. 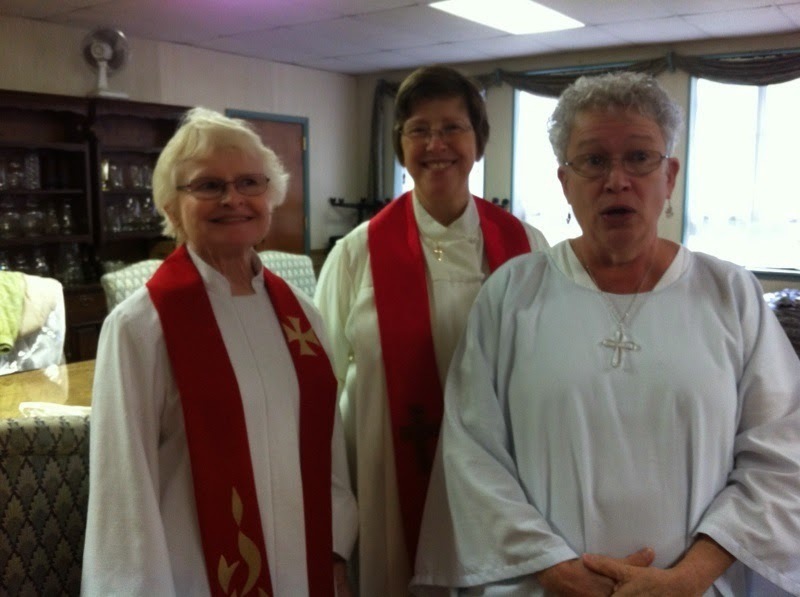 Women's ordination isn't simply about making women priests. It's about helping church leaders recognize that if they were to include women in their leadership as their equals, they could truly be a powerful force for economic and social justice for women and children throughout our world.'" CLEVELAND, Ohio -- Six more women will claim ordination as Roman Catholic priests or deacons on Saturday, in a ceremony the church says has no validity and incurs automatic excommunication. "I don't accept the verdict that I am excommunicated," said Mary Collingwood of Boston Heights, who will be ordained a "servant priest," as she put it, by Bishop Bridget Mary Meehan of Sarasota, Florida. "The men made that rule, and a man-made rule can be changed -- especially if it's unjust. "I align myself with the belief that I am part of the people of God," she said, noting that saints from Joan of Arc to the Australian nun Mary MacKillop, canonized in 2010, once were declared excommunicated. 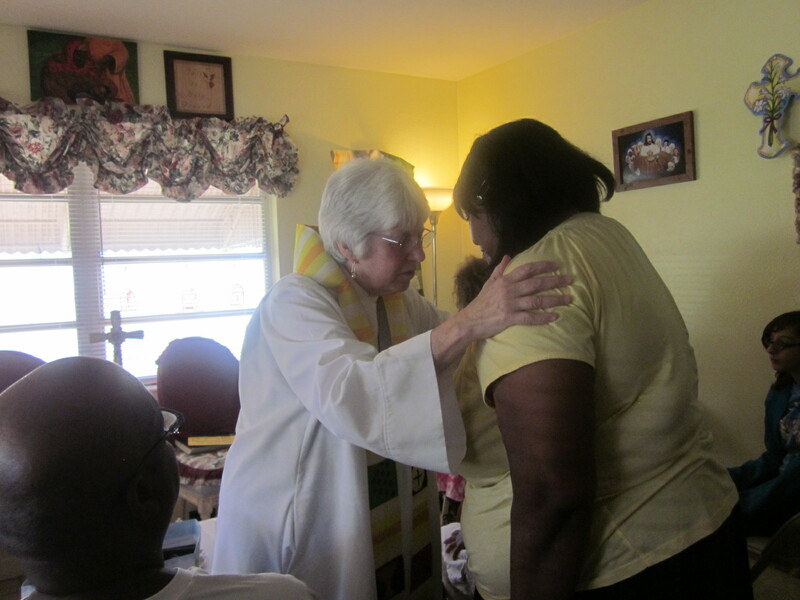 Susan Guzik of Eastlake, who will be ordained as a deacon, said it was hard to step away from the parish, St. Mary Magdalene in Willowick, where she has been a diocesan-certified lay minister, pastoral leader and parishioner for 60 years. "But all my friends are still my friends," she said. "We're still Catholics. We believe we are the church. "There have been times I've wondered if I'm doing the right thing. "I am doing the right thing...."
Saturday's ordination, at least the sixth in the United States this year, includes women from Canada and as far away as New Mexico. Collingwood said they are following conscience and being obedient to a higher authority. "We're rising up and claiming our rightful role in the institution," she said. "I call it an awakening. It started about three years ago, but my whole life prepared me for that." Collingwood, 61, the married mother of seven and a grandmother, has a master's degree in theology and taught high school and college theology. She is a past director of the Cleveland diocese's pro-life office. "I have given 40 years of service to the institutional church," she said. "I realized I was being called to help change and reform the church. "I want to die knowing my footprints were headed in the right direction." Guzik, 78, the widowed mother of five, a grandmother and great-grandmother, said she will, like Collingwood, enjoy the support of her entire family at the ordination. 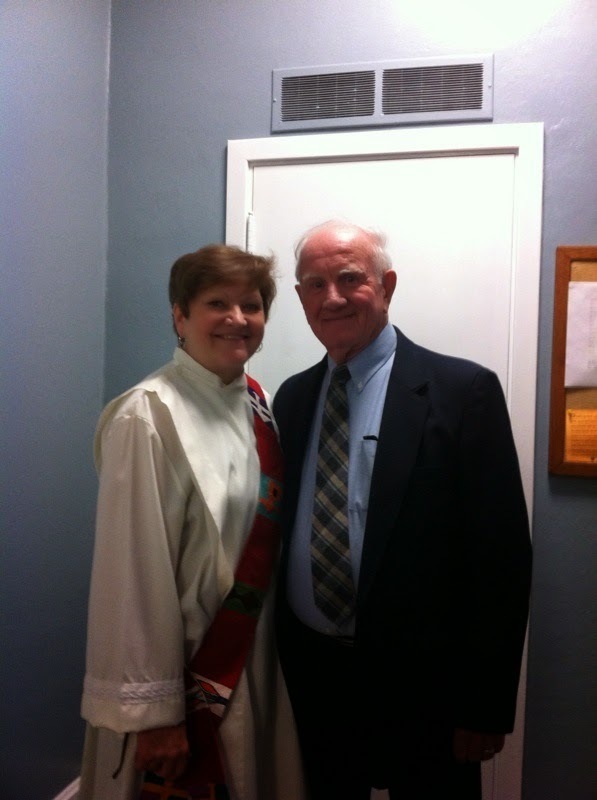 The support extends to pushing her to make her diaconate a transitional one. She hopes to be ordained a priest next year. "At first I thought I was too old, but other people my age or older have inspired me." Having stepped away from her parish, she said her place will be "anywhere God is calling me." Starting on June 7, one of those places will be Brecksville United Church of Christ, where Collingwood and Ann Klonowski, who was ordained last September, will say Mass weekly at 5 p.m. Saturdays. Collingwood said it will be a community where "all are welcome at the table. "The sacraments are not rewards," she said. "They are essential nourishment for people on the journey. "There are so many people on the margin who don't have a spiritual home, and we will embrace them. Jesus excluded nobody." The International Movement We are Church (IMWAC) , on the 20th Anniversary of the Apostolic Letter of Pope John Paul 2 , Ordinatio Sacerdotalis , entitled ’ Reserving Priestly Ordination to Men Only ‘ calls on Pope Francis to recognise that this Magisterial teaching is not supported by the vast proportion of the Catholic Faithful and ought to be changed . We believe that the call to Priesthood is a Charism of God , based on Baptism and confining it to ‘men only’ limits the power of God . This continued ban on women from priestly ordination is an injustice in the Church which must be confronted by the Catholic Faithful as a matter of conscience. Accordingly Canon Law 1024 which states that only a male can be validly ordained is an unjust law and should be withdrawn as a matter of urgency. What Pope Francis wrote in his recent letter ‘ Evangelii Gaudium’ regarding the ordination of women - ‘The reservation of the Priesthood to males , as a sign of Christ the spouse who gives himself in the Eucharist ,is not a question open to discussion’ - does not represent the Sensus Fidelium of the convictions of not only the Catholic faithful but of very many clergy and some hierarchy as well. In this letter Pope Francis is reiterating what Pope John Paul 2 wrote in his Apostolic letter 20 years ago condemning women’s priestly ordination - ‘ we declare that the Church has no authority whatsoever to confer Priestly ordination on women and that this judgement is to be definitely held by all the Church’s faithful – ‘ . Even at that time this magisterial teaching banning women from Priestly Ordination was disputed by Bishops and Faithful alike within the Catholic Community . In April 1976 the Pontifical Commission concluded unanimously that ‘ It does not seem that the New Testament by itself alone will permit us to settle in any clear way and once and for all the problem of the possible access of women to the Priesthood ‘ and by a significant majority it concluded that ‘The church could ordain women to the Priesthood without going against Christ’s wishes ‘. This magisterium of these Biblical theologians has been rejected by successive Popes including Pope Francis . Equally the magisterium of the’ Sensus Fidelium’ has been rejected by successive Popes. It is now the right time that the Papal magisterium should allow free and open discussion of Women’s ordination within the Catholic Church without fear of excommunication . It is also right that those within our Catholic Community who have been unjustly excommunicated because they publicly articulated that reserving priestly ordination to men only has no basis in scripture or human reason should be fully accepted back within our Communion . ‘Banning women from Priestly Ordination is a continuing injustice which has no basis in the New Testament , is a continued stain on the fabric of the Catholic Communion and most importantly the younger generation find this ban a stumbling block to their Faith in the Risen Lord’ stated Brendan Butler , spokesperson , We are Church Ireland . 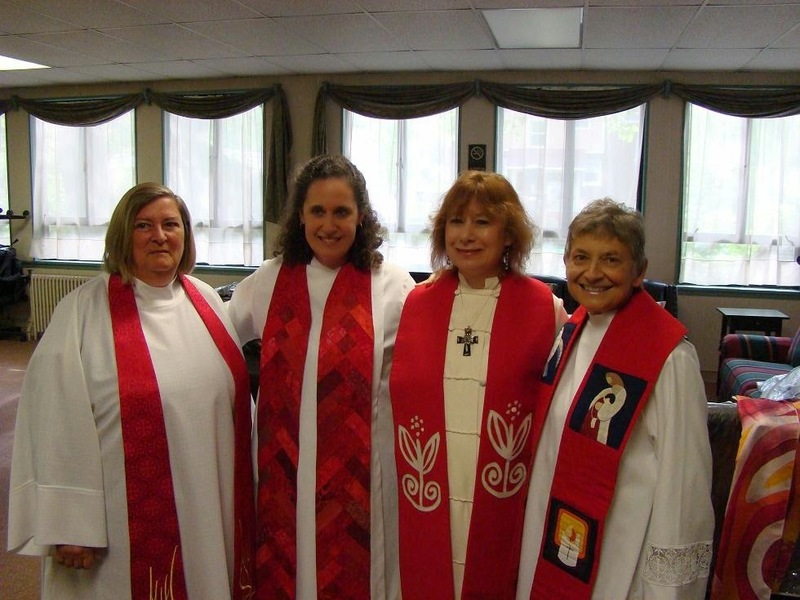 Despite 20 years of blatant discrimination of women and denial of women’s basic human rights as spiritual equals before God, women priests are serving in priestly ministry. With almost 200 Roman Catholic Women Priests, a renewed priestly ministry is flowering in 10 countries. Catholics worldwide are ready for a new model of church led by women and men. 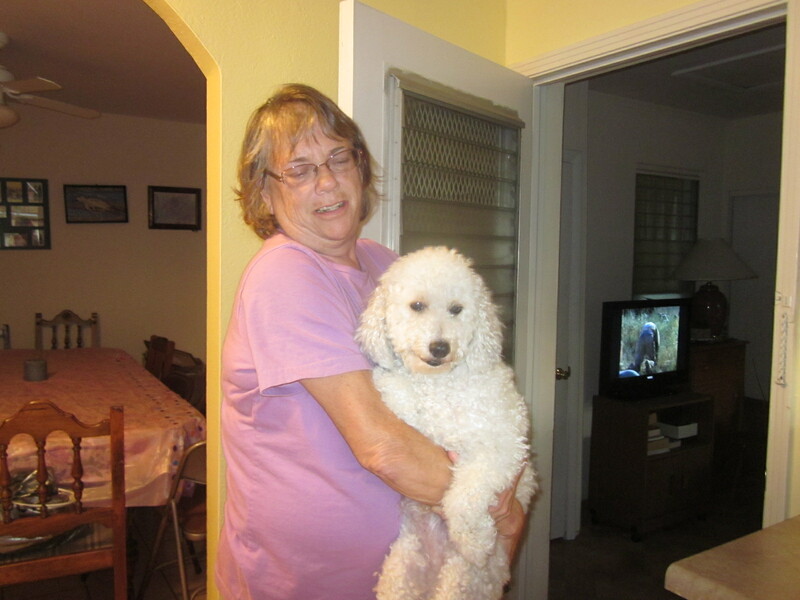 Mary Bergan Blanchard of Albuquerque,NM marybblanchard@hotmail.com 505-857-9288, is a widow, mother, grandmother, teacher, writer and licensed counselor. Twenty of the 37 years she spent teaching were with the marginalized and the Early Childhood disadvantaged. After retiring in New Mexico, she served as a Mental Health Counselor in a Roman Catholic Church for 20 years. 216-408-4657, is a wife, mother and grandmother who, with her advanced degree in theology, has served for 40 years in church ministry and taught theology on the high school and college levels. In the parish she was Director of Religious Education, Coordinator for Marriage Preparation and Pastoral Minister. On the diocesan level she was an administrator and served on various boards and councils, an activist for church reform. 614-357-0626, has advanced degrees in theology, pastoral counseling and family therapy. She is currently working as a hospice chaplain having completed her Provisional Board Chaplaincy Certification. 519-735-3943, has been married for 32 years and has extensive experience in a variety of professional and volunteer capacities from wellness educator and health care administrator to retreat facilitator and dancer. She is currently a counselor and art therapist. She is engaged in theological study and has a particular interest in women’s spirituality and a passion for integrating sacred arts in liturgy. In May flowers begin to bloom everywhere and even in Florida the season is festive as welcomed rain begins to fall and gentle breezes blow. to celebrate at our Good Shepherd Church. The month of May has been packed with wonderful celebrations in our Good Shepherd Church. We have had Mother’s Day, Graduation Day and Birthday Celebrations. 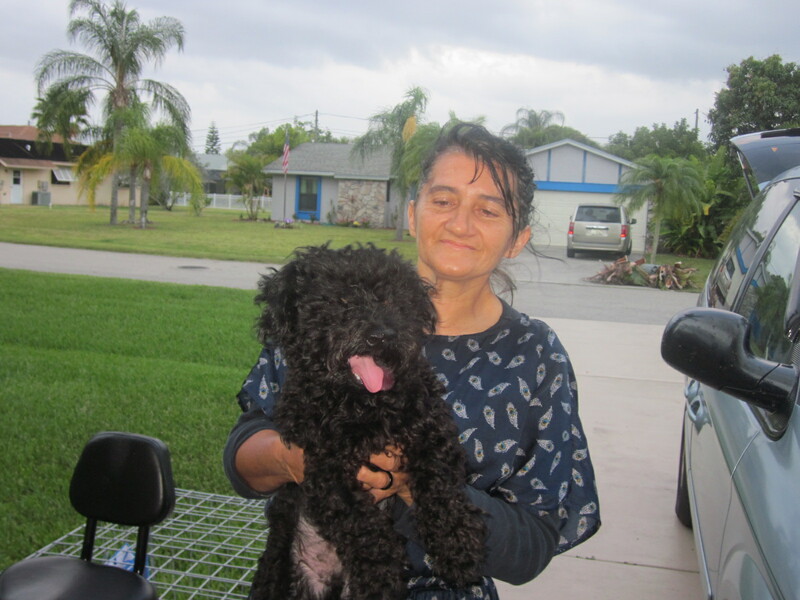 And we also had Rose and her much loved dog reunited as Rose moved into our Hospitality room at Joshua House on May 2nd. Mother’s Day was a very special event honoring all of the women in the church. 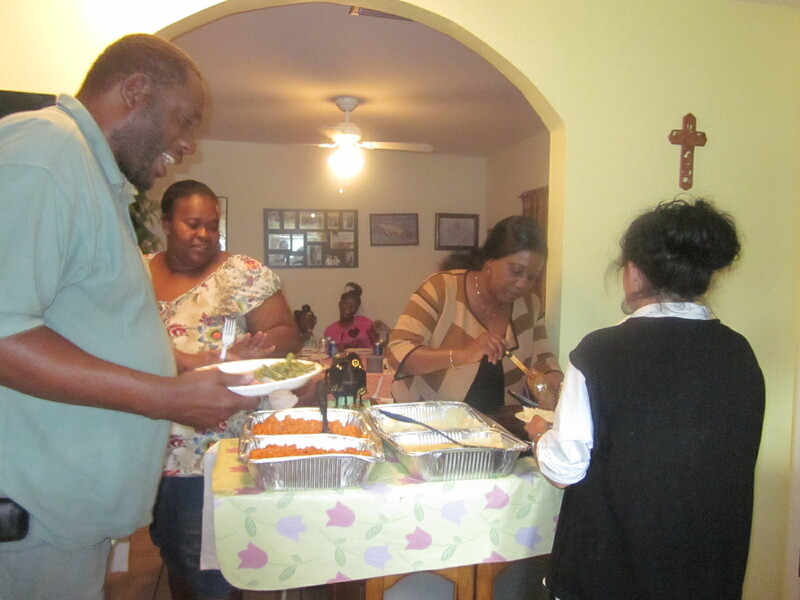 Each woman was given a personalized gift and Pearl Cudjoe made a wonderful meal that Linda Maybin helped her to serve. Pearl and Linda are serving Robert and Lili with Jakeriya in the background. 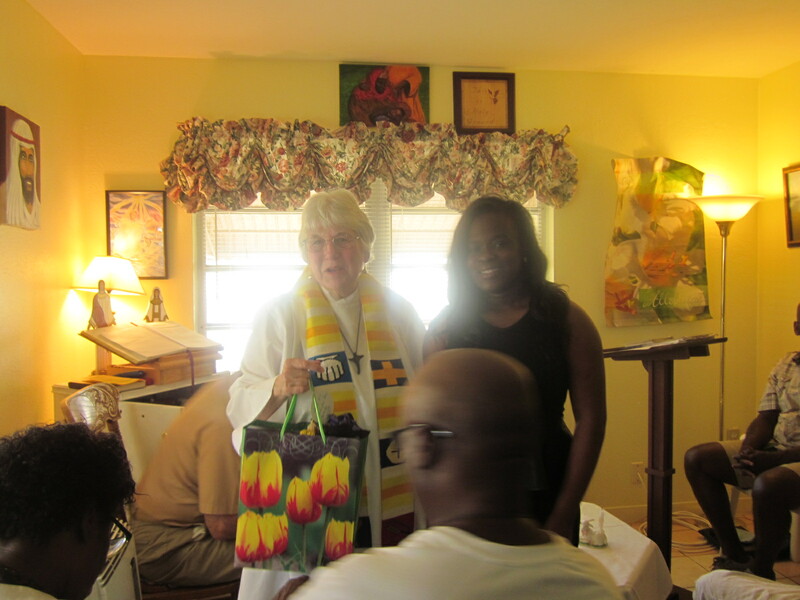 The congregation also presented Pastor Judy Beaumont and I with gifts for Mother’s Day. 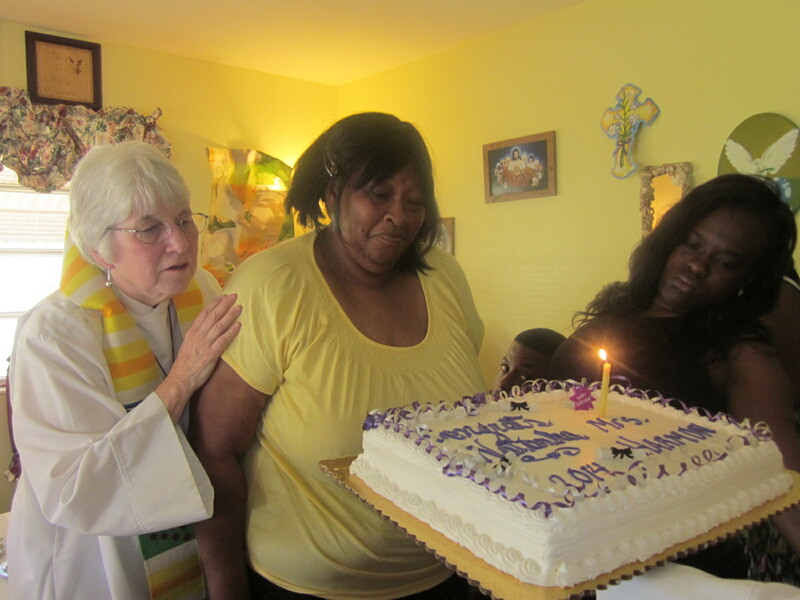 On Sunday May 18th we celebrated the Birthday of our church Grandma, Mrs. Jolinda Harmon who has brought her daughter Linda and fourteen of her Grandchildren to attend Good Shepherd over the past five years. Mrs. Jolinda Harmon in yellow with her Grand daughter Natasha Terrell whose Graduation on 5/17 we also celebrated. 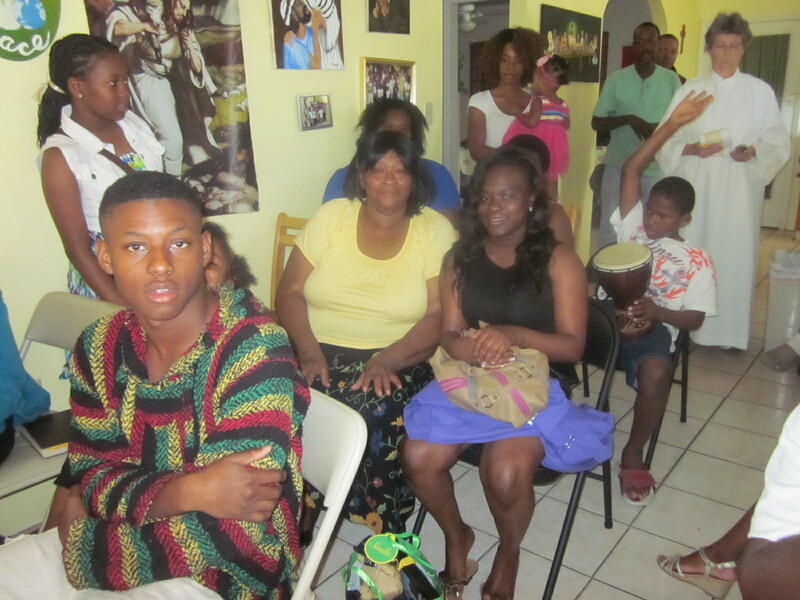 Grandsons Ty Powell in front and Keion Lewis beats drum in rear. Natasha Terrell graduated from Cypress Lake High School on Saturday 5/17/14. She made all A’s in her Senior year. She has been accepted to three Colleges and , so far. plans to attend the University of South Florida,St. Pete Campus to study Nursing. She hopes to become a neonatal Nurse. 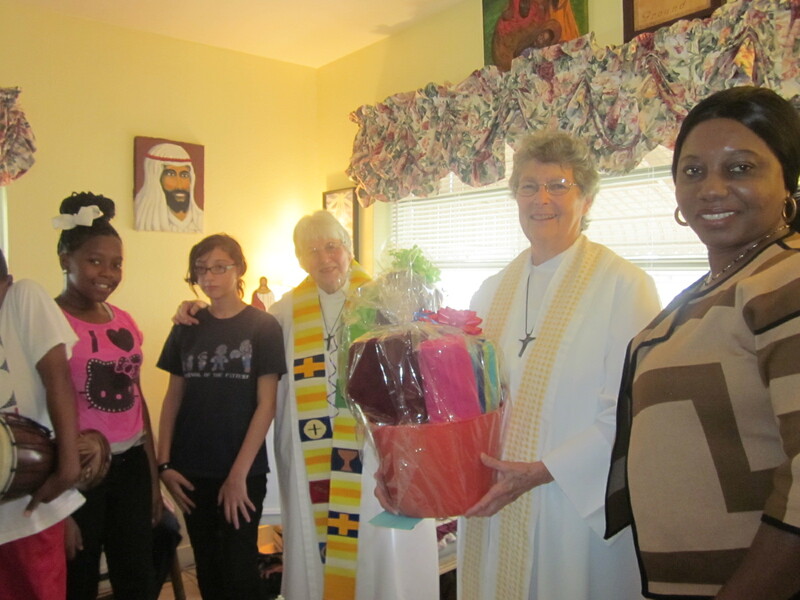 She was given gifts and a special blessing then a hearty round of applause. We are so proud of Natasha! Here Grandma Harmon and Natasha share a cake. 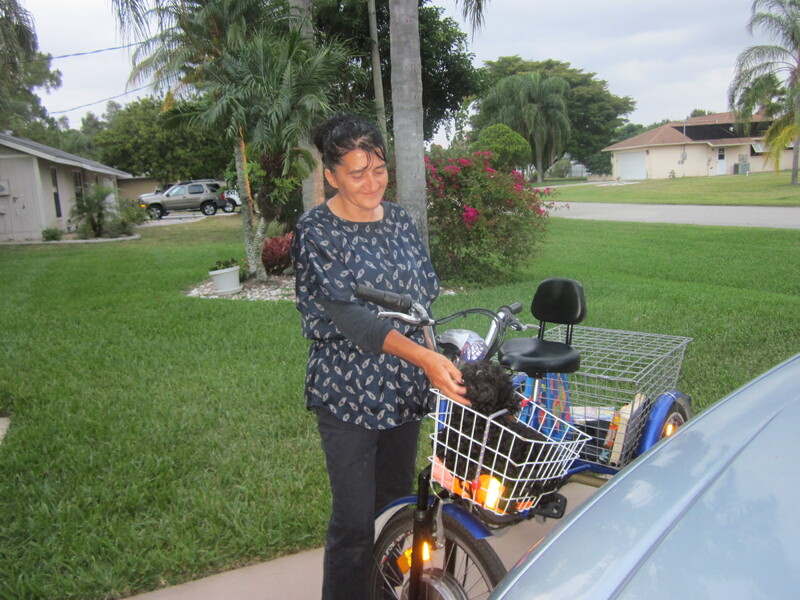 And later Lili brought her dog Spike and her new bike to visit us. She was in an accident with a car. She was not hurt but her other bike was beyond repair. She depends on her bike to get to work. She was distraught, but her son Gaspare, now completely recovered from his surgery, helped her to get a gently used bike. 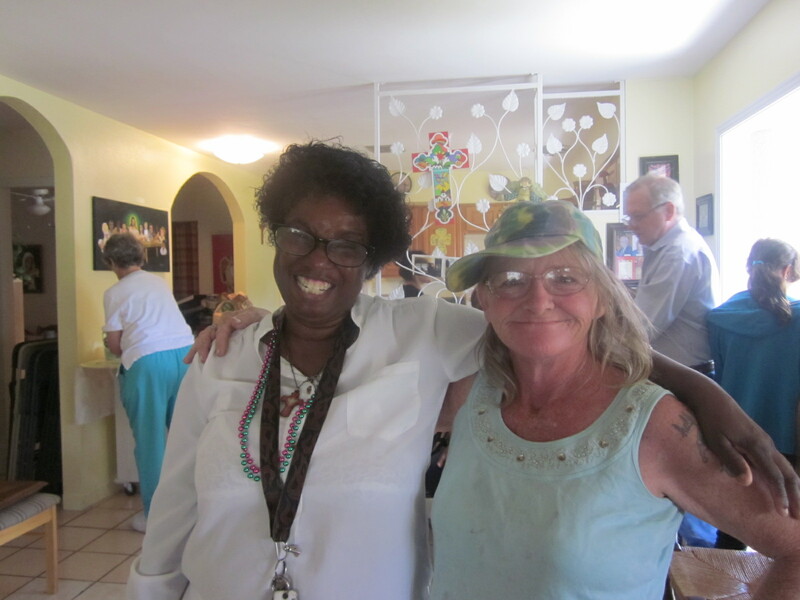 His recovery and his assistance made for a very happy Mother’s Day for her.She also had her rear basket filled with her Thrift Store Treasures, videos for our Good Shepherd children. as we become Church together! May is a wonderful month for celebration! Thanks be to God! that people were open to having a woman serve them as priest. in 2013, with three more to be ordained in various American cities this month. celebrated by the women priests. that, according to Meehan, definitely includes women priests. that the people of God deserve much better." 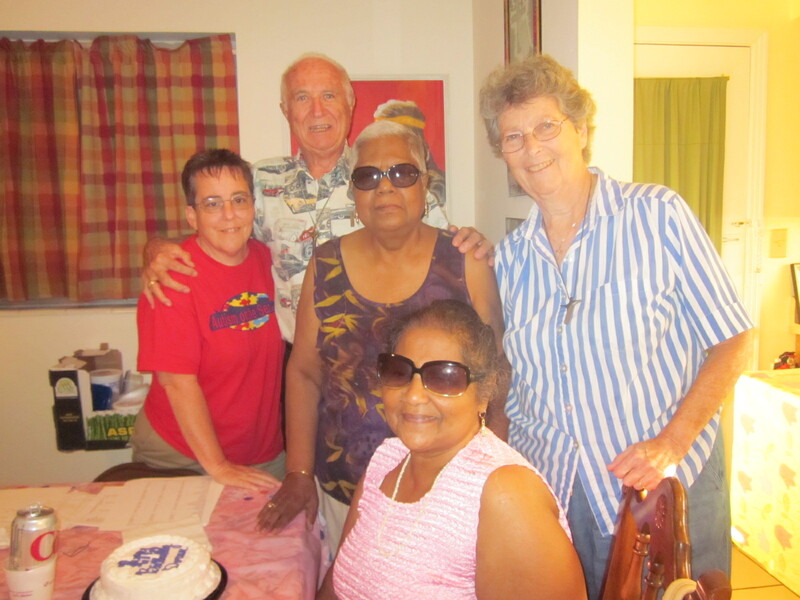 by Tim Troglen | May 18, 2014 Boston Heights -- On May 24 Mary Eileen Collingwood will take another step in her journey of faith and service to the Lord. "[But] our policies, both secular and religious, have been totally written by men," Collingwood said. 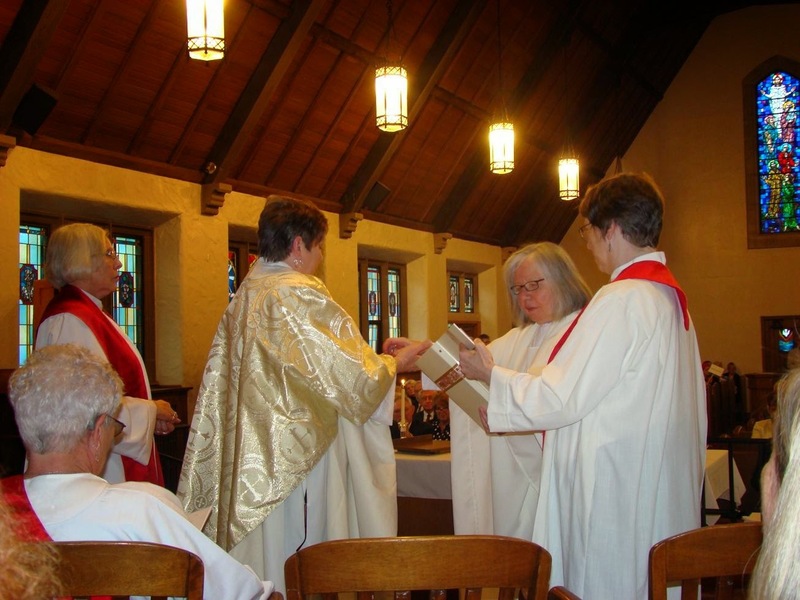 "Women have had no input in our canon law or our pastoral teachings -- even the Bible was written by men..."
On Friday night, May 16, our Resurrection Community in Cincinnati celebrated the ordination of Paula Hoeffer as priest and Kathleen Bean as deacon. The entire community and guests gathered to witness this joyful event as Paula is an original member of our community -- four years old this May. 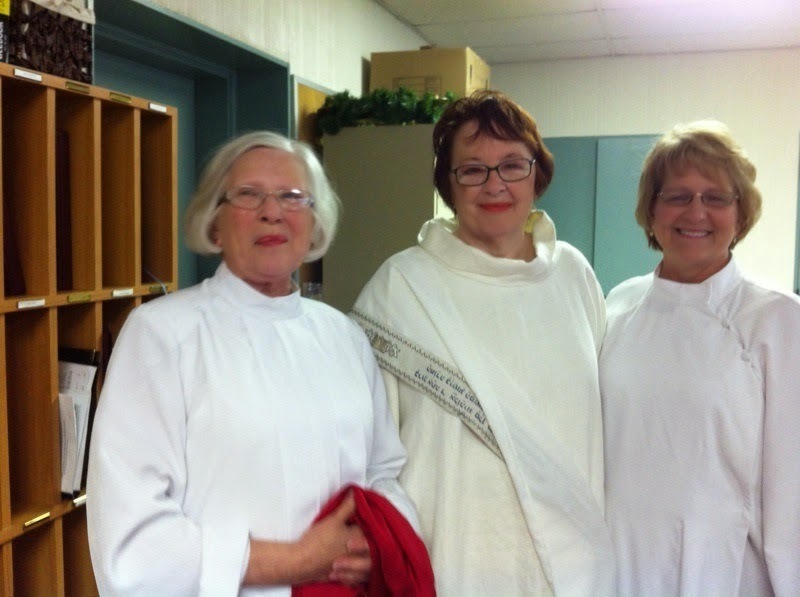 Presiding bishop was Joan Houk from Pittsburgh of the RCWP Great Waters Region accompanied by RCWP women priests who participated in the ordination. 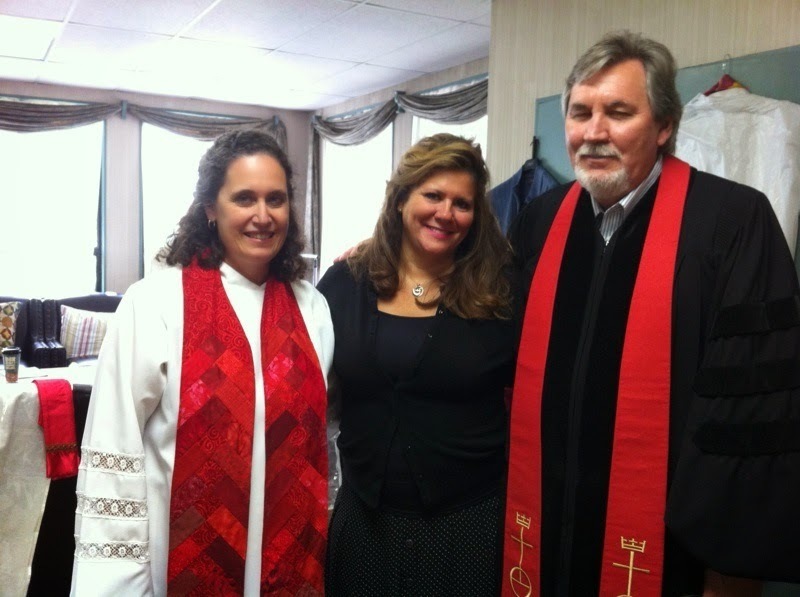 Dr. Debra Myers, who was ordained an ARCWP priest in Cincinnati last May, vested Paula along with Ed Hoeffer, Paula’s husband. 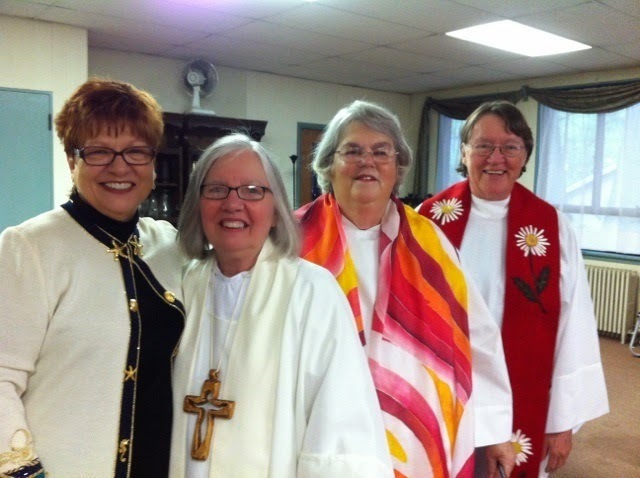 ARCWP priests who serve the Resurrection community include Dr. Debra Myers of nearby Batavia, Rosemarie Smead of Louisville, Donna Rougeux of Danville, KY and Janice Sevre-Duszynska of Lexington who lived in Cincinnati from 2009-2011. The Resurrection Community rose up around Janice's priesthood. At Wednesday night’s monthly Eucharist at Resurrection Community, Janice led the community in blessing for Paula’s priestly ordination.